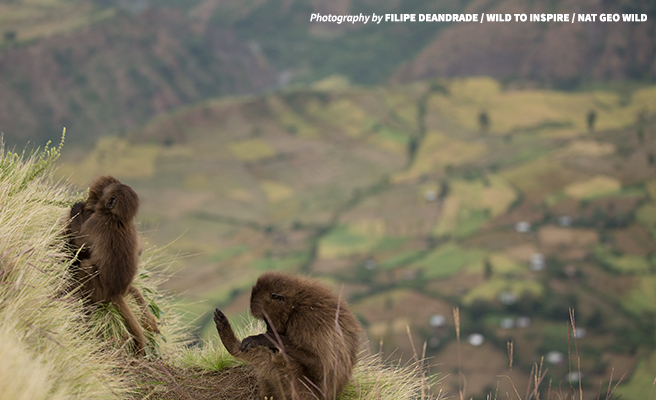 With a plethora of endemic species of birds, mammals and plants, there’s no other place on Earth quite like Ethiopia’s Simien Mountains National Park. The protected area encompasses more than 400 sq. km of mountains in the northern part of the country, including Ras Dejen, one of the highest peaks in all of Africa. It’s also the East African nation’s only natural World Heritage Site. The national park was established in 1969, primarily to protect the landscape’s unique wildlife. This includes the walia ibex, a wild mountain goat with large, scimitar-like horns; the gelada monkey (sometimes called the “bleeding heart baboon”), the world’s last species of grass-eating primates; and the Ethiopian wolf, our planet’s rarest canid. More than 200 species of birds and 250 species of plants are also found inside the park. The Simiens offer more than just critical habitat for rare wildlife, however. They’re also an important watershed for the region, with several year-round rivers originating inside park boundaries. These rivers are an essential source of water for communities downstream in Ethiopia, Sudan and Egypt. Despite its ecological significance, threats to the health of this ecosystem and its inhabitants abound. Pressures arising from growing human activity, combined with the impacts of civil war during the late 1980s, led to dramatic habitat degradation and sharp declines in both Ethiopian wolf and walia ibex populations. As a result, the UN Educational, Scientific and Cultural Organization (or UNESCO) moved the park to its List of World Heritage Sites in Danger in 1996, where it has remained ever since. Human activity continues to pose the most significant threat to the park and its wildlife. Today, 582 households, representing more than 3,000 individuals, are located within the park. Another 1,477 households are found around its perimeter. These locals have two main options for supporting their families: agriculture and livestock. But, as communities expand their cultivation and seek out grazing areas for their livestock, the park suffers. Grazing inside the park in particular has gone largely unregulated and unmanaged. This is now the leading cause of soil erosion and habitat degradation within park boundaries. Encouragingly, however, the proverbial tide is turning for this unmatched landscape. In 2007, the Ethiopian Wildlife Conservation Authority (EWCA) was established under the country’s Ministry of Culture and Tourism. 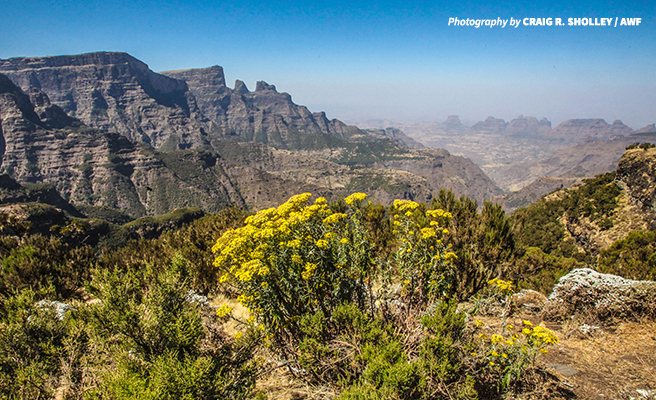 The authority is responsible for overseeing 10 national parks within Ethiopia, including Simien Mountains. Like many wildlife authorities across Africa, EWCA’s capacity has been limited by a shortage of resources, meaning scout patrols for wildlife protection have been irregular and enforcing park regulations has proven difficult. That’s where AWF comes in. In 2012, AWF joined forces with EWCA to develop alternative sources of livelihoods for the people living in and around the park—ones that would help protect natural resources, rather than exploit them. First, a team of ecotourism experts from AWF visited the park with EWCA staff to assess its tourism potential, identify the areas most in need of conservation intervention and chart a way forward. Next, input on tourism options was gathered from both local communities and the national tourism industry, ensuring stakeholders at all levels were on board with the project. 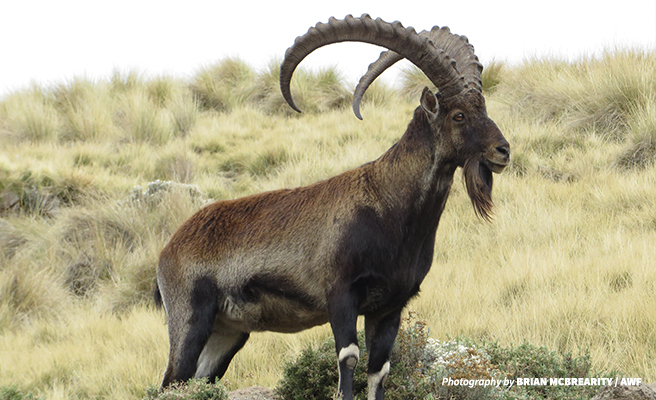 From these efforts, AWF developed a comprehensive tourism plan for the Simiens, which earned EWCA’s stamp of approval in 2014. Much work needed to be done, however, to put this plan into action. While veteran guides working within the park boasted in-depth knowledge about its flora and fauna, newer guides hadn’t received any training to bring them to the same level as their more seasoned colleagues. Through technical experts, AWF trained 60 guides in field knowledge, customer safety and more. AWF also sponsored a handful of EWCA staff members to attend an international ecotourism conference in Nairobi, Kenya in 2013. In terms of park infrastructure, AWF has pitched in to better optimize the national park experience for visitors. These efforts have included providing new signage for the park, supporting the development of a tourism lodge that will help fund a nearby school (also supported by AWF), and assisting with the creation of tourism operations that are owned and operated by local communities and modeled after area guest houses. With a sound tourism plan and infrastructure in place, AWF and EWCA set their sights on a new target: improving the overall management of the park. To that end, the two parties entered into a collaborative management agreement for the Simiens in December 2014. This was the first partnership of its kind in the landscape, and was designed to ensure that both communities and the wildlife authority were able to generate enough revenue from the park to meet their needs in ways that were sustainable over the long term. A key component of achieving this long-term sustainability was to find a solution to the overgrazing issue, one that would allow communities adequate access to grazing areas for their livestock while also enabling habitat within the park to recover. What was needed was an agreed-upon grazing strategy. To develop such a strategy, AWF and EWCA again engaged stakeholders at all levels, undertaking an enormous participatory process involving all of the communities in and around the park. Eventually, the parties reached a consensus to designate 92 percent of the park as a protected zone where no grazing would be permitted. The remaining 8 percent was allocated as a sustainable resource-use zone where “cut and carry” extraction and controlled grazing are permitted to various degrees. 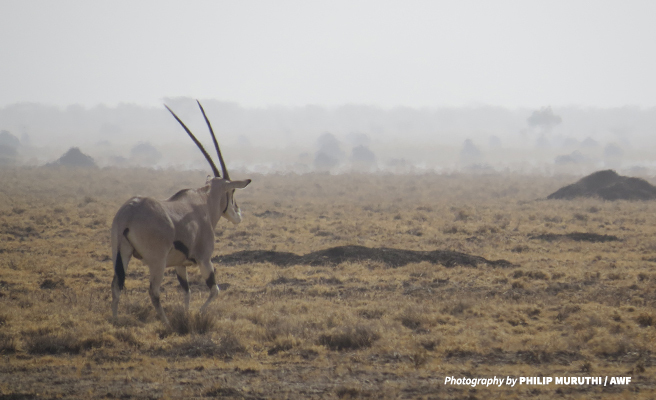 As AWF and EWCA have ramped up their efforts, wildlife populations within the park have also been on an upward trajectory. According to EWCA, only 600 walia ibex were found in the park in 2006. By 2015, that number had grown to nearly 1,000. The Ethiopian wolf is also bouncing back; its population has increased from a mere 80 individuals to 140 in the same time period. The wildlife authority has been so pleased with the results of the partnership that it has asked AWF to team up again in another one of Ethiopia’s important wildlife areas: Hallaydeghe Wildlife Reserve. Near the central part of the country, the reserve is in the process of being gazetted as a national park, at which point it will be called Hallaydeghe–Assebot National Park. The Hallaydeghe landscape and its wildlife are significantly different from that of Simiens—local species in the low-lying grassland and woodland area include Grevy’s zebra, oryx and the occasional lion. But the issues of grazing and agricultural expansion, coupled with very little infrastructure for alternative sources of income, are just as present here. The approach taken in Hallaydeghe may ultimately need to differ from that taken in the Simiens. But the success AWF and EWCA have achieved together up in the mountains bode well for addressing the challenges that lie ahead in this savanna to the south. 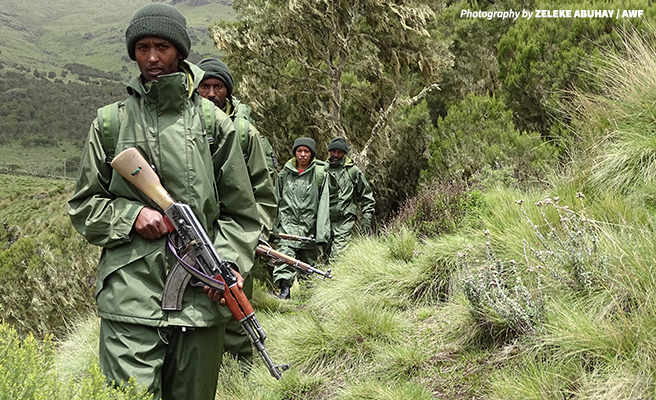 This article is the third installment of a series examining AWF’s holistic approach to conservation in the Simien Mountains. Read the first article for more on the overarching strategy that drives our work, and check out article no. 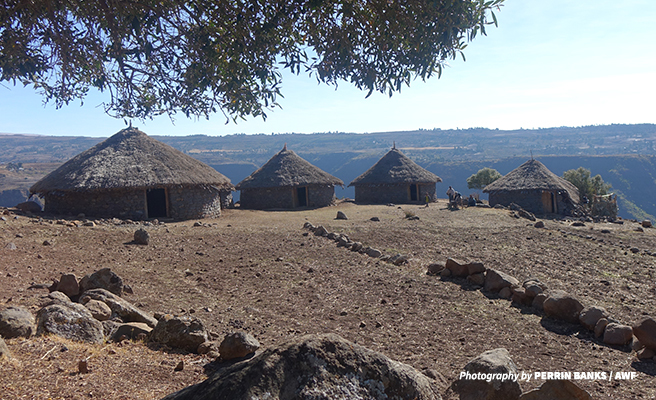 2 to see how AWF is linking conservation with education in this remote landscape. Hannah is AWF's content specialist. She assists with the production of content for AWF's organizational publications, website and other materials. Hannah received her Bachelor of Arts in Political Science and International Relations from William Smith College, where she also completed a minor in Studio Art. She has studied abroad in South Africa, Uganda, Rwanda and Thailand.